A special Thank you to Allison and Busby for sending me this book to review. Zahra, Kali, and Syd would never have met if their parents' marriages hadn't fallen apart. But when the three girls collide in group counselling, they discover they have something else in common: they've each been triple-timed by the same nefarious charmer, Eric, aka Rico, aka Rick. Talk about eye-opening therapy. Cheerful, diplomatic Zahra is devastated. How could she have missed the signs? Folksy, flirtatious Kali feels almost as bad. She and Rick had only been on a few dates, but they'd felt so promising. Hardened vintage-vixen Syd is beyond tears. She and Eric had real history...Or so she'd thought. Now all three girls have one mission: to show that cheater the folly of his ways. Project Payback is such a success, the girls soon have clients lining up for their consulting services. Is your boyfriend acting shady? Dying to know if your crush is into you? Need match-making expertise? 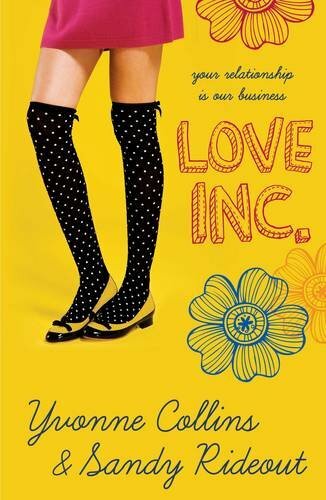 Look no further than Love, Inc. Cute contemporary romance! This is a John Tucker Must Die kind of book. You know? All the girls are dating the same boy and when they realize it they plan a list of adventures to teach him a lesson. Down right hilarious in parts! Characters are all so diverse this will appeal to many. The girls set up their own business to help other girls in their relationship problems. What a novel idea! What is great is that the girls develop a relationship from strangers to best friends. Something good came out of all of it. I enjoyed it! I'm enjoying a lot of contemporary right now and this one was fun! This looks really cute! I think I would enjoy it :) Great review!